Since we humans first emerged from the primeval swamps we've needed to keep our cooking utensils dry. Tea towel history goes back a long way. Given that knives, forks, pots and pans have barely changed since Roman times, there's a good chance that some kind of drying tool goes back thousands of years with them too. The Romans might have been smart, but they didn't invent the dishwasher. Given its clearly useful and day-to-day function, it's no wonder we've developed such a fascination with that most fundamental of kitchen accessories, the tea towel - or dish towel as it's sometimes called in the US. But it was only later, with the increasing availability of textiles and sewing material in 18th century Britain, that tea towels progressed beyond being merely a functional item to dry the dishes - and developed into something far more creative. From man's earliest beginnings, let's now fast forward to the 18th century. This was when tea towels reached the height of their class and fame (not to be matched until the arrival on the scene of the Radical Tea Towel Company in the 21st century!). Tea towels graced the highest tables of the land and were made of linen, a fibre derived from the flax of linseed plants. The soft texture of the fabric made them ideal for drying the expensive bone china preferred by the English upper classes, and tea towels were flourished with pride by the grand ladies of the time who were more than happy to do the drying up, not trusting their prized plates to their clumsy servants. When not drying their fancy crockery, these ladies would embroider the towels, creating beautiful heirlooms to be passed down through the generations. With all those servants, they did have plenty of time on their hands. True to its name, the tea towel was in its element as an ingredient in the great British tea ceremony. There it rubbed shoulders with the finest crystal and chinaware and was designed to match the rest of the table linen. Tea towels developed other uses: they were wrapped around a tea pot to insulate it, used to prevent drips or gracefully draped over bread and cakes to keep them fresh. It wasn't until the Industrial Revolution and the 19th century that the tea towel became a more widely available consumer item, and manufacturers turned to durable fibres such as cotton. In the early 20th century, American housewives - in good democratic tradition - would often reuse rough cotton animal feed sacks by cutting them up into dish towels (also known as 'flour sack towels'). Not content with their unfinished appearance, however, they embroidered them with intricate patterns, despite the difficulty of working with the coarse weave of the sacks. This tradition of decorating tea towels and using them for creative expression arguably become more important to many people than their obvious functional utility. When materials are brought into the home, we often want them to say something about our tastes - whether items of clothing or kitchen accessories (what are tea towels and apron really but clothing for the kitchen?). Sadly, later in the 20th century many households moved away from tea towels and began using more paper towels instead. Cheap, disposable, bad for the environment - and thoroughly boring. Still an object of fascination in the 21st century, the tea towel is established as a canvas on which we can paint not just pretty designs, but our feelings, our thoughts and our beliefs. 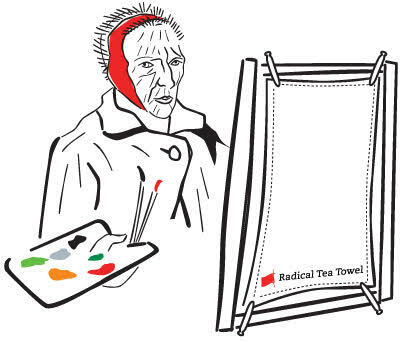 At Radical Tea Towel, we decided this tradition was worth embracing - and building upon. In today's more democratic times, we've been pleased to bring fine tea towels to the masses with bold but timeless social and political commentary! Your certainly don't get that with paper towels. The tea towel (or dish towel) must be one of the most flexible items there is. No doubt your first thought is "here's something to dry the dishes with". But that would overlook the huge range of other uses to which tea towels have been put over the years. The most unusual and distinguished of these must be as a canvas by none other than the great artist, Vincent Van Gogh. Late in his career, the impoverished genius often ran out of conventional canvas, which was in any case quite expensive. He would write to his brother, Theo, imploring him to send more, but in the meantime painted on whatever came to hand. And if that was a tea towel, so be it. In fact, research has shown that 'The Large Plane Trees' and 'Wheatfields in a Mountainous Landscape' were painted on table cloths, or tea towels. Some of Van Gogh's works seem to be painted on tea towels with a red border - perhaps they came from the kitchen of the Auberge Ravoux in Auvers where he was staying at the time? A still life with flowers by Van Gogh, painted on a tea towel, fetched £2.1m at auction in the year 2000. So keep hold of your kitchen tea towels - you never know, it could pay you back handsomely one day. Not all of us can aspire to be great painters, of course but we can still be imaginative in putting our tea towels to new uses... Several of our customers at Radical Tea Towel have said our tea towels are too good for drying the dishes and so they've hung them on the wall instead. Other wackier suggestions are: A shepherd's head dress in your child's Nativity play? Or peg one to a stick and wave it on your next demonstration? Knotted at each corner, a tea towel should offer a lot more protection from the sun than a mere handkerchief. Forget the pillow fight, why not have a tea towel fight? Or fold one in two, sew up two sides and put some handles on - you've got a handy little 'bag-for-life'. And speaking of environmentalism: don't just throw your old tea towels away. Why not cut them up into dish cloths or floor cloths? The possibilities and fun are endless. Please let us know if you dream up a particularly radical use! Of course, you could always use a tea towel as originally intended - as a kitchen accessory. Something creative that will bring a breath dash of color to one of the most important rooms in the house. And something, we hope, that will spark more than a few interesting conversations.